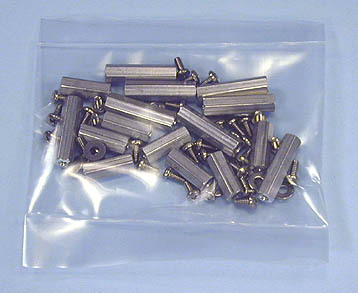 This generic board accepts a wide range of circular connectors. The customer provides the circular connector of interest and mounts it on CB8 using supplied standoffs and screws (photo of standoff kit at bottom). 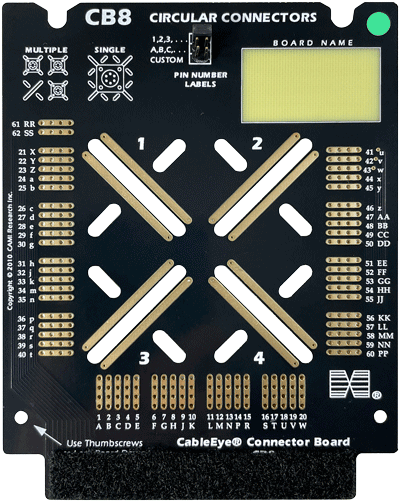 Any panel-mount circular connector with four mounting holes fits the "X" pattern slots on this board. Connector pins are wired to labeled pads surrounding the board. Connectors of up to 62 pins can be accommodated. When the wiring is displayed, a generic dual-row header is shown for the circular connector, and a jumper setting on the board determines whether lettered or numbered pin labels are used. You may mount up to four small circular connectors (mounting hole spacing less than 0.9"), or one large connector (mounting hole spacing less than 2.3"). If desired, non-circular connector types may be mounted also, provided that they can be supported with standoffs and the pin count is 62 or fewer. A bare area is available for labeling the board. You may use two CB8 boards together, or a CB8 in combination with any other CB board to accept any cable type. See photos of custom CB8 applications. Set of two boards.